Exercise scientists at the Korey Stringer Institute use advanced testing equipment in the Human Performance Laboratory housed in the Department of Kinesiology in the College of Agriculture, Health and Natural Resources at the University of Connecticut to examine your current level of performance and fitness. Our testing can not only assure that you are exercising safely, but also so that you can obtain your maximal level of performance. 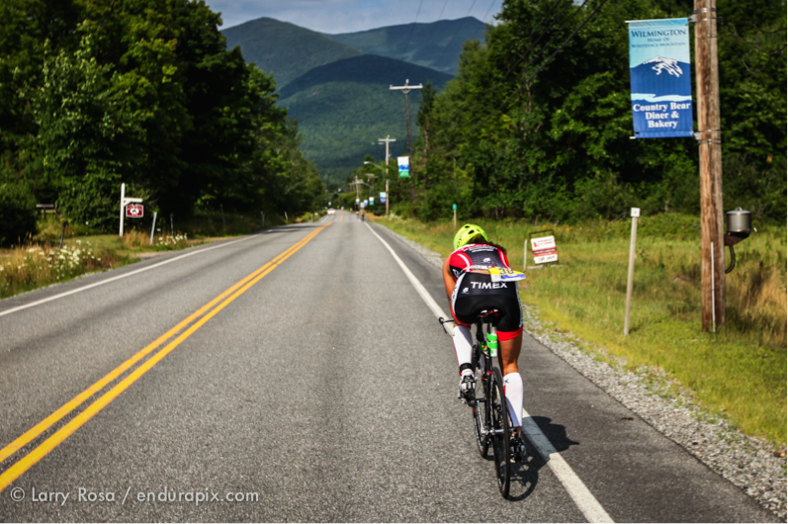 KSI Assisted Athletes in the Ironman Lake Placid 2012. KSI provides the testing options to fit your needs so you can OPTIMIZE YOUR PERFORMANCE AND BE SAFE. We offer the following testing options as well as feedback that you can use immediately! Whether you are looking to assess your baseline aerobic fitness level or conduct repeated tests leading up to that bigrace, KSI can help you. The VO2max test is the most commonly used test to assess the cardio-respiratory fitness of an athlete. The more aerobically trained you are, the better you are able to utilize oxygen. While gradually increasing the intensity of either running or cycling we measure how much oxygen your body is using. This is especially helpful for athletes who wish to see their current fitness status and tailor training off this value. 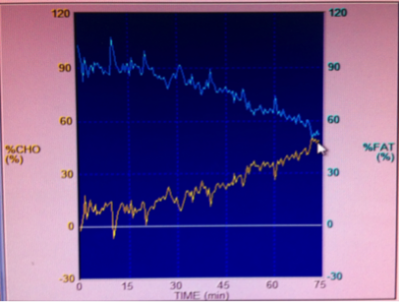 During your VO2max test we can also provide your velocity at your VO2max VVO2 which really tells you more about your aerobic capabilities as well as give you an estimate of your anaerobic threshold (AT). With these values we can help to identify speed or heart rate zones in which you can train. Last we can provide you with your exercise economy and/or running economy (RE) which is the energy demand for a given velocity. Runners/cyclists with good RE use less energy and therefore less oxygen than runners/cyclists with poor RE at the same velocity/watts. 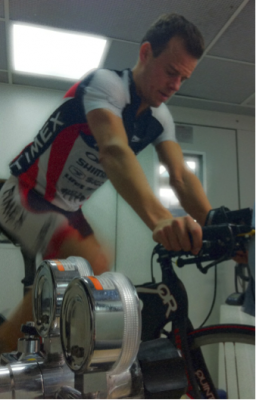 Chris Thomas, Timex Multisport Team Athlete conducting a VO2max test. Interested in knowing if you burn predominately carbs or fat at race pace? What you use for energy at different speeds/watts is important for you to know going into training or a race so that you can replace those calories. With a modified VO2max protocol we can determine how much energy you are using at a given intensity and what percentage of that comes from carbohydrate or fat. When combined with our nutrition and hydration analysis, we remove the guesswork from your diet plan. Sample substrate utilization print out. The key to a great hydration plan is knowing what you are losing while you exercise. To determine your sweat rate we measure your body mass losses through sweating and urination and take into account your fluid intake during a standardized exercise session. Knowing your sweat rate will reduce your body temperature and heart rate enabling you to maintain performance. To determine your electrolyte needs we use the gold standard whole body washdown technique. With this method we are able to determine the exact amount of electrolytes you lose in your sweat in order to help you understand what you need to replace. We will provide you the exact amount of electrolytes you lose in grams of sodium, potassium and chloride (per hour and per liter of sweat) so that you can better replace your losses and keep moving in those long hot races. 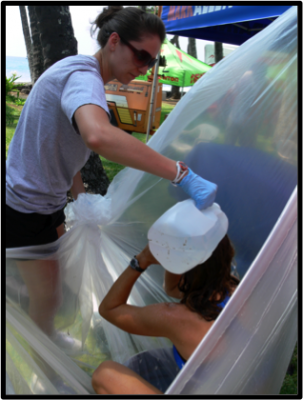 Whole body sweat electrolyte washdown at Kona Ironman World Championships in 2011. With our environmental chamber set to 104°F and 40% humidity we will have you exercise for 90-minutes to observe how your body reacts to the heat. 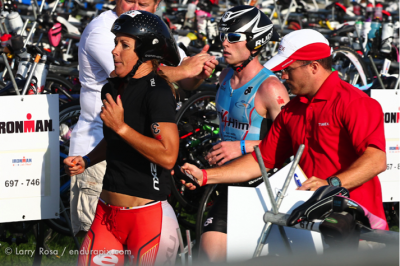 Understanding how well you handle heat stress can help you prepare for training or racing. If you have struggled in the heat previously this test in com\bination with a VO2max test can enable us to provide you with a sample return to activity and acclimatization protocol that suits your needs. For victims of heat illness such as exertional heatstroke, a specific meeting with one or more experts to determine your course of action for resuming activity. Core body temperature monitoring at the Lake Pladic Ironman in 2012. Your lactate threshold is the exercise intensity at which lactate begins to accumulate in your blood. This can be measured through finger or ear pricks during a progressive exercise bout. Similar to the anaerobic threshold, this ramping protocol can help tailor your training intensities and pace to your exact physiological responses, thereby optimizing physiological gain during your training. This testing can take place on a bike or treadmill, expanding the benefits to runners, cyclists, and other athletes. Elite triathlete Chris Thomas warming up for his lactate threshold test. Have a race coming up in the heat? Heat acclimatization not only can improve your performance in the heat but in warm and cool weather races too! Decreased heart rate and body temperature coupled with more efficient sweating and increased blood volume are all benefits of 10-14 days of heat acclimatization. Gain access to our environmental chamber to acclimatize to any climate. Exercise testing performed at the Korey Stringer Institute is tailored specifically for each athlete. We provide you with the information you want and provide results you can use to maximize your training. Our Human Performance Laboratory, a 7,800 sq. ft. facility located inside of Gampel Pavilion features top of the line equipment to perform any of our services in a safe, controlled, and effective manner. In addition to our environmental chamber that is capable of simulating both hot and cold conditions, we are able to perform certain tests outdoors to increase the applicability of your results. The Human Performance Laboratory is also involved in a wide array of research topics such as environmental physiology, muscle physiology, reproductive physiology, lipid metabolism, children’s fitness, women’s health, muscle biochemistry, nutrition, cardiovascular physiology and disease risk factors, weight loss and strength training. When you come for your test, one of our experienced staff members will work directly with you. Our staff has a broad array of athlete testing expertise with athletes of all ages and competition levels. Specifically, we have worked with the NFL, elite triathletes as well as youth and high school athletes. Whether you are trying to reach the next level in competition or simply optimize your training, we can help you gauge your abilities and develop techniques to increase performance. We do not simply provide you with a number after your testing is complete. Not only do we provide detailed analysis of your test results, we provide a follow up discussion with every test, to fully explain your results and help apply them to your training. Any services provided by the Korey Stringer Institute are on a consulting basis only. Our services are not substitutes for professional medical advice, diagnosis, or treatment. Always seek the advice of your physician, athletic trainer, or other qualified health provider with any questions you may have regarding a medical condition. The Korey Stringer Institute and the University of Connecticut simply offer suggestions to optimize the prevention, recognition, and treatment of certain medical conditions. Reliance on any information provided by the Korey Stringer Institute, Korey Stringer Institute website, Korey Stringer Institute employees, others assisting the Korey Stringer Institute at the invitation of Korey Stringer Institute is solely at your own risk.